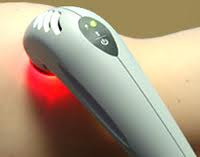 Treatment for acute and chronic pain conditions, arthritis, wound healing, addictions, and cosmetic revitalization. Lasers work by supplying energy to the body in the form of billions of photons of light. The body absorbs this laser light on a cellular level and transforms it into chemical energy, which the body then uses to commence its own tissue repairs. The bio-stimulating effect of laser therapy causes a decrease in inflammation and pain and an increase in tissue regeneration and healing.